The Neptune Systems Apex Aquarium Controller System includes everything to monitor and control your aquariums from anywhere in the world. It monitors temperature, ph, orp, salinity along with 8 individual controllable outlets. The Neptune Systems Apex Aquarium Controller System does all the dirty work for your aquarium so you can do more important things like fragging your corals or layng on your couch and enjoying your aquarium. The Apex System has built in Wi-Fi, an incredible 802.11g/n Wi-Fi connection with reliability that rivals a wired connection. The Apex System comes with all the essentials for monitoring and controlling a reef like controllable power outlets, temperature, pH, ORP, salinity, etc. What's awesome about the Neptune Systems is that it allows you to monitor and control the conditions of you tank using your laptop, tablet, or mobile phone.You don't have to go to your aquarium to check the conditions of your tank anymore. Everything can be monitored and controlled from the touch of your phone. Talk about convenience! The Energy Bar 832 was redesigned from the ground up and includes eight 120V AC outlets, an internal 100W 24VDC power supply, three built-in 1LINK ports and two 24VDC accessory ports. Each individual outlet has power monitoring and there are individual LED indicators for each outlet. Wi-Fi Internet connectivity! Allows remote access and control via laptop, tablet or phone. Only controller with web browser Monitoring, Control & Configuration. Most expandable Controller (Up to 240 modules, hundreds of probes, and thousands of controlled outlets). Simple menu driven Configuration: No program language knowledge required. Will this controller work with GHL light bars? and if they do could i control intensity? ex: ramping the lights up in the morning and ramping them back down at night. This controller will not work with GHL accessories. Just a quick question, I am going with the orbit marine loop system for lights and pumps and was curious if this system and the loop system will compliment each other or fight each other? Current USA Loop is not compatible with Neptune's Apex system but you can operate these two side by side as two independent systems with no problems. When are you coming out with the kh and calcium controller all package togueter .? Trident KH and Calcium control module should be available later this year. I bought my Apex “WIFI” Controller System along with the APEX Dosing Package after attending MACNA 2017 in New Orleans. I had been very interested in getting an APEX for my Red Sea Max S 500 for over a year but after talking with the guys in the Neptune booth at MACNA (the 10% discount helped also) I decided to pull the trigger. The equipment showed up at the house in three days (free shipping BTW & no tax) and I was ready to dig into the setup. The longest part of the setup was deciding on the layout of new APEX board to house the existing equipment along with room for expansion. It was also a bit tricky to get it all into the cabinet below the tank in the chiller section. After I got it cut out, drilled and painted I attached it to the aluminum frame of the stand. The layout works and I do have a little extra room for additional modules in the future. I moved the plugs for my return pump, protein skimmer, UV sterilizer, heater and my doser (that I utilize to dose NOPOX) into the EB832 and configured all of them without any issues. I must say that the Getting Started guild from Neptune is very helpful and clearly walks you through everything to get it up and running. Within a couple of hours my Red Sea Max S 500 was running via the Apex. I am now working to get the DOS and DDR configured and setup. Dinged a star for WiFi. It would not connect. Had to hardwire to router, and update firmware. Than manually assign WiFi info thru admin local interface. Good thing I know a bit about electronics and IP. It still will not reconnect at times after reboot or power loss. Maybe something it doesn't like in my router chipset. Do not try to calibrate probes for the first 1 or 2 weeks. They will Drift. You will waste your calibration fluid and need more in the first week. Temp probe if needed can be done after a half hour in tank. I wont get into the wonderful things it can do for you there are plenty of forums for that. It has been stable as long as I don't reboot (WiFi 75 percent chance of reconnecting) or make a lot of configuration changes. Which will require a reboot. I equate a reboot to most electronics. My phone asks to do it weekly. PC after updates, Cable box in middle of the night. Ipad gets slow. They should build an automatic reboot option into firmware. always us redundant back ups on critical systems. The accessories, compatibility, versatility, and coming TRITON system make this the controller to have. This is quite an upgrade from Neptune Systems in my opinion. 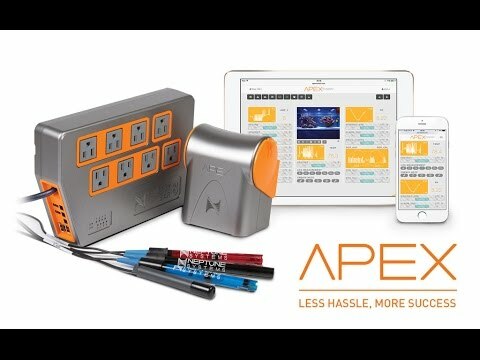 I have seen all of the other products coming out including Fishbit and was wondering what I would do to upgrade my Neptune Apex Jr. This was the right answer for me. Some people were having problems with the EB832 and connection issues, but I have never had anything go wrong as of yet and been using it for a couple of weeks. All of the probes are pretty much spot on. The control options are endless and I feel I have only touched the surface of what I can do with this system. The tank is almost too easy now as I just sit back and watch for when I am needed! !